First up is the exciting news that the sequel to Wanderer’s Escape is not only in progress but is within a week or so of being finished – well, the first draft at least. I don’t have a definite date in mind for release yet but it should be by the end of August and potentially sooner. Another piece of exciting news is that I’ve now sold over 1500 books. That is… well, it’s a truly staggering achievement. Mid January I was happy having sold 14 books. Then things started to take off and, well, they haven’t really stopped. I’m currently selling around 600 books a month, and almost all the feedback and reviews has been positive which is even more important. 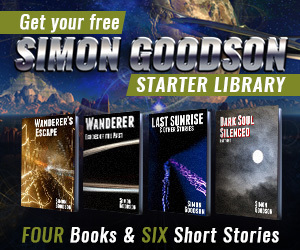 1) Publishing one or two more free short stories here on www.simongoodson.com. You can already get The Wedding Weatherman right now. 2) Looking into publishing my books via Print On Demand – meaning physical books. I’ve promised myself physical copies as a 40th birthday present so this has to be done by November. 3) Expanding beyond Amazon. This one is a maybe. The benefits of the free days with KDP select are great, but being exclusively locked in to Amazon isn’t. Watch this space. Well, that’s it for now. I’m off to grab a quick tea and get back to writing. The story is at this really gripping point where… ah, ah, ah… no spoilers!